The way he saw it, learning about the Son of God shouldn’t be so boring. He wanted to be engaged by the teachings of Christ, and he wanted others to be as well. It was in this pursuit that Valendy found St. Mary’s University, which proved critical in his journey. He chose St. Mary’s because of its Teacher Education program and an opportunity to play soccer. By his junior year, his interest in soccer had waned, but not his interest in ministry. 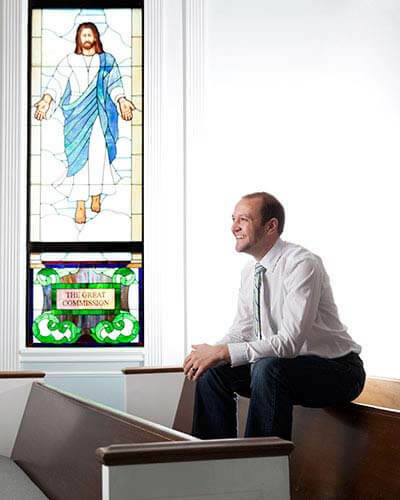 While at St. Mary’s, he spent two years in University Ministry. He took an immersion trip to Mexico’s Uxpanapa Valley, where he lived and worked with a butcher and his family. He also tried his own service projects, such as giving up one meal a day for Lent, then using the money saved to buy burgers for homeless people. It was these experiences — as a Methodist in a Catholic university community — that helped him see how living the Word of God should be taught. He went to divinity school, and he married his high school youth group sweetheart, Estee, who also had pursued a career in ministry. And still, St. Mary’s stuck with him. In 2011, he used a $1,000 gift from an aunt to start Fort Worth Dish Out, a crowdsourcing effort that is part of Sunday Soup, a grassroots model for funding small-to-medium-sized creative projects. Here’s how it works: People pay $20 for admission and vote on which of three local entrepreneurs pitch the best project that serves the common good. The winner gets 60 percent of the proceeds, and the other two split the remaining 40. The first event had 178 attendees. Momentum built. Winners included a company that prepares organic meals for cancer patients and a group that provides tutoring and clothes to high-school-aged mothers and their babies. There have been 13 events, and Fort Worth Dish Out has taken on a life of its own, even though Valendy has moved on to other projects. In June 2012, he and Estee were appointed co-pastors of Saginaw United Methodist Church near Fort Worth, which celebrates its 100th anniversary this year. Never in its history had the church had multiple ministers, but the congregation has been receptive to his message and teaching style, he said.